Home » Did Ancient Aliens Impart Advanced Astronomical Knowledge to the Dogon Tribe? Skeptics and proponents of the ancient aliens theory have faced off for decades on the issue of the Dogon tribe’s allegedly advanced astronomical knowledge. Here’s a look at some of the arguments on both sides concerning this tribe from Mali, Africa, and its purported knowledge of the motions of a star not visible on Earth without modern telescopes. Sirius is the brightest star in the sky and had a prominent place in many ancient cultures. 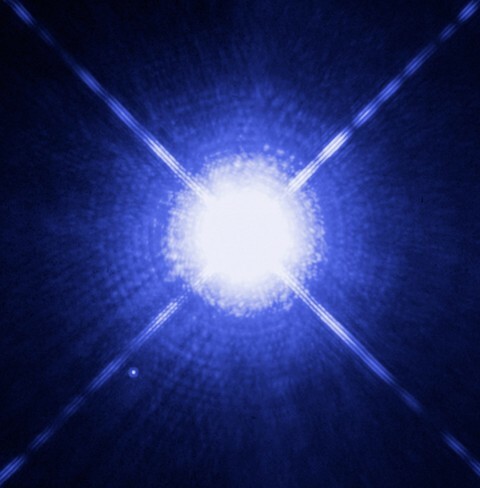 Sirius, which is about 8.7 light years from Earth, has a white dwarf companion star, Sirius B. Sirius B cannot be seen with the naked eye, and astronomers first guessed at its existence in the 1830s. They mathematically developed a theoretical model of its orbit around Sirius (now referred to as Sirius A) later in the 19th century. The astronomers knew that Sirius B must be made of a super dense matter, but the specifics were beyond their comprehension until quantum physics helped explain it in 1926. In 1894, irregularities in the movement of Sirius B led astronomers to consider that a third star, Sirius C, may exist and exert an influence on Sirius B’s orbit. It is still a matter of debate whether Sirius C exists or not. The Dogon are said to have known all of this centuries before Western astronomers began contemplating it. For them, Sirius is a three-star system. They allegedly accurately describe Sirius B: they say it is a companion star for Sirius that is invisible from Earth, that it has a 50-year orbital period, that it travels around Sirius A along an elliptical path, and it is made of a heavy substance not found on Earth. The Dogon are also said to have understood that the Earth and other planets rotate on their axes, that they orbit the sun, that Jupiter has four moons, and that Saturn has a ring around it. 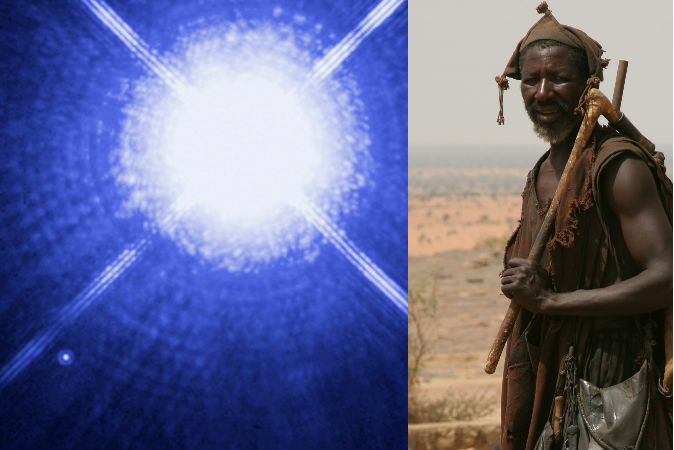 Could The Dogon Have Somehow Seen Sirius B Themselves? But skeptics and ancient aliens proponents generally seem to agree that the Dogon could not have observed Sirius B or its orbit around Sirius A themselves. The only way Sirius B would have been visible to the Dogon (and all other cultures) is if it were a red giant a few thousand years ago, according to Liam McDaid, an astronomy professor at Sacramento City College and a senior scientist for non-profit organization The Skeptic Society. If this were the case, anyone could have easily observed both Sirius A and Sirius B in action. Some say the ancients indeed described Sirius as a red giant. “The second problem is that ancient writers seemed to use color for stars in a way different from the way that we do (they described Pollux, Arcturus, and Capella as ‘red’—a modern observer would call them yellow-orange, orange, and yellow, respectively). McDaid concluded, as did famed astronomer Carl Sagan, that the Dogon’s knowledge of Sirius B must have come from an advanced culture. Sagan and McDaid said it must have come from modern Western culture, others say this is unlikely. What are the Chances of Receiving the Knowledge From Western Contact? The theory that the Dogon possessed this advanced knowledge of Sirius B is based on the anthropological accounts of Dr. Germaine Dieterlen, the Secretary General of the Société des Africainistes at the Musée de l’Homme in Paris, and Dr. Marcel Griaule who visited the tribe together in the 1930s. Robert Temple’s book “The Sirius Mystery,” published in 1976, popularized the ancient aliens theory as an explanation of the Dogon’s knowledge. He refuted the arguments given by Sagan for why the Dogon may have gained the astronomical knowledge through contact with the Western world. During an interview for a BBC special, she had shown a 400-year-old Dogon artifact representing the three stars of the Sirius system. This part was edited out of the American broadcast, Temple said, which may be why American skeptics have overlooked this evidence and Dieterlen’s testimony. Temple said the knowledge of the Sirius system is pervasive in Dogon culture, “embodied in … hundreds or thousands of objects, symbols, woven blankets, carved statues, et cetera.” He thinks it is impossible that the knowledge could have seeped into the culture so quickly from the time Western astronomers made these discoveries to the the time Dieterlen and Griaule began their research in 1931. In 1979–1980, anthropologist Walter van Beek studied the Dogon. He found the Dogon cosmology much different than reported by Griaule and Dieterlen. Van Beek said the Dogon understanding of the Sirius system was not clear or unified. He received various explanations from various Dogon sources, and some of them said what they knew of the system came to them from Griaule. Griaule has been criticized for using leading questions and planting the astronomical knowledge in the Dogon, while Griaule’s daughter Genevieve Calame-Griaule has also criticized van Beek’s methods. It is unclear whether changes in the Dogon since the 1930s may account for van Beek’s findings. The Dogon’s contact with Western society, with people who would have known of the astronomer’s discoveries, was limited in the 19th century into the early 20th century. But, some interaction did occur, so it is not impossible that they came into contact with the information this way. Even if they did, however, is it possible they already had this understanding of the Sirius system?